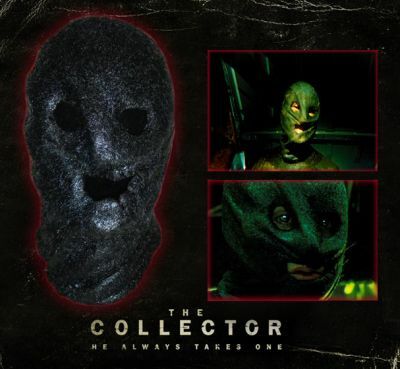 The Collector is a 2009 horror film originally titled The Midnight Man and was originally intended to be a Saw prequel. Desperate to repay his debt to his ex-wife, an ex-con plots a heist at his new employer's country home, unaware that a second criminal has also targeted the property, and rigged it with a series of deadly traps. This is “The Collectors”(Juan Fernandez) main hero screen used mask worn throughout the entire film by Juan Fernandez, Steve Upton (Juan's Stunt Double), and Garry Tunicliffe (Make-up effect designer and hand double). Used in multiple scenes including stunt work. This particular mask has words wrote inside of the mask along with obvious signs of wear and studio prop blood from being used during various stages in the film.